Set in the courtyard of a 1940s hacienda and bordered by terraced beds of flowers, trees, and its own restaurant, the sunken clubhouse court at the La Quinta Resort & Club has always seemed like a symbol of the resort's commitment to tennis. Tennis there burst onto the national stage in 1978 when a consortium of former players led by Charlie Pasarell set out to build the finest resort tennis club on the planet. It became one of the first resorts to offer all three playing surfaces—hard, clay, and grass (though the grass is now gone)—and Pasarell and company made sure it rose to national attention by staging a professional tournament (originally sponsored by Grand Marnier) that eventually spawned into own stadium. Those were heady days. From the very beginning, I've been one of La Quinta's staunchest partisans. Its Clubhouse Court is hands-down the most beautiful court at a resort anywhere, and the later addition of a spa next door and a courtside fitness center only seemed to add to the allure. At 23 courts—18 hard and 5 Har-Tru—it remains one of the larger resort complexes in the desert. The setting is magnificent, the rooms exceptionally comfortable, the cuisine excellent. The original Spanish hacienda-style hotel and its 20 cottages opened in 1926 and immediately attracted Hollywood celebrities and California moguls, who braved 20 miles of bad road beyond Palm Springs to reach this retreat among citrus trees at the foot of the starkly imposing Santa Rosa Mountains. Since then the road has improved and the resort grown to 620 casitas and 98 villas. Yet this doesn't feel like a large hotel. The scale remains low—nothing taller than two stories—and the rooms have been cleverly arranged around numerous small gardenlike courtyards each containing a small swimming pool and hot tub (all in all, there are 41 pools and 53 hot tubs). Although it is no longer difficult to reach the rest of Palm Springs desert and its many restaurants and galleries, there is little incentive to leave the resort. All the rooms are a short stroll from a flower-bedecked plaza of shops and restaurants, so why get in your car when you can stroll over to the Adobe Grill for fishbowl-size margaritas served in hand-blown glassware from Guadalajara or its superb dishes from various regions of Mexico, like grilled rack of lamb with roasted corn and date tamale from the Yucatan or Caldo de Mariscos, a southwestern bouillabaisse? Unless you're here in March and have tickets to the Indian Wells Tennis Tournament, you'll be perfectly content staying on property, playing tennis and relaxing at the spa or around one of the pools. The consortium that started the tennis club—Charlie Pasarell, Arthur Ashe, Stan Smith, Bob Lutz, Tom Gorman, Marty Riessen, Roscoe Tanner, and Dennis Ralston—guaranteed by location and design that the courts would be a focal point of the resort. Tables from a restaurant and bar, now renamed Centre Court Cafe and filled with tennis photos, spill out onto the flower-filled patio overlooking the sunken clubhouse court. The complex is further anchored by a swimming pool, fitness center, and tennis pro shop. The effect encourages hanging out, before and after matches. Tennis Staff. Kevin Connolly took over as tennis director on March 1, 2019. 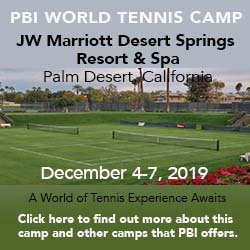 A graduate of South Carolina's Coastal Carolina University, where he played Division 1 NCAA tennis, Connolly has been part of the desert tennis scene since 1992, most recently as the director of the Peter Burwash International-managed Westin Mission Hills Resort. He inherits a well-oiled program, known for its quality game matching and a roster of weekly activities that include drill sessions, clinics, Cardio tennis, and, during periods of peak demand, junior clinics. Courts & Fees. There are 21 tennis courts—16 hard and 5 Har-Tru, 8 of them with lights for night play—and 2 pickleball courts. Court Fees: $28-$32/hour on hard courts, $38/hour on clay. Golf Courses. Golfers who stay here can test themselves on 90 inspired holes, including the TPC Stadium, Jack Nicklaus Tournament, and Greg Norman courses at nearby PGA WEST and the resort's own Pete Dye Mountain and Dunes courses. If they come up lacking, they can always check into the acclaimed Jim McLean Golf School. Spa & Fitness Center. La Quinta 23,000-square-foot spa is remarkable for its elegant South of the Border architecture and abundant outdoor treatment rooms that manage to be both private and open to views of the sky, stars, and haunting desert mountains. Workout enthusiasts got a 4,000-square-foot fitness center adjacent to the tennis clubhouse. That handsome building has counterpane windows on both sides, with the cardiovascular equipment set to look out on the courts, and contains a full suite of LifeFitness machines and dumbbells as well. The center also has a lengthy roster of daily workouts, including yoga, Pilates, aqua-aerobics, stretch classes, and power walks. Camp La Quinta takes children ages 4 to 12 for half-day and full-day programs as well as weekend evening programs, mainly during the major holidays. There are 804 rooms, suites and villas mostly arrayed around gardenlike courtyards with swimming pools and outdoor whirlpools. Lodging ranges from the vintage casitas--a tiny one-bedroom cottage--to villas and several configurations of suites, from junior or what is really a small home. Most of the lodging clusters around a series of courtyards all with small swimming pools and hot tubs. Check with the resort's web site for rates on the dates you want to visit. Seasons. The resort is open year-round but confine your tennis vacation to the period from October to early May. High season typically begins in mid January and extends through April.